A simple smoothie takes you a long way in a tiring day. And an extra super green smoothie takes you even longer! Imagine yourself with that extra energy and zeal in that important meeting with clients in the morning. Then you totally forget about eating until lunch time! Believe me, that’s exactly what you are going to gain off this simple yet energetic drink; or meal as I would call it. Here Follow our instructions to make a fresh super green smoothie. 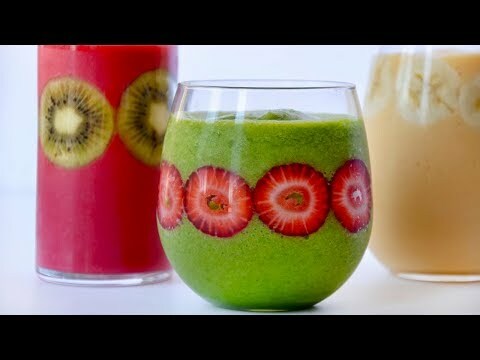 A quick breakfast and a handy take-to-go delicacy, green smoothies are the favorite of someone who watches the diet. Greens like Kale, spinach, and broccoli, when added to a fruit smoothie, makes for one simple, yet healthy green smoothie. A basic green smoothie is an amazing way to incorporate more greens into your everyday diet. Being plant-based, a green smoothie is easy on the stomach, making it easy to digest. This DIY (Do it Yourself) green smoothie can easily be done at home which constitute 37 calories per 100 grams. What Is Super About this Green Smoothie? This super green smoothie contains the simplest yet nutritious and healthy ingredients. So much so like a regular green smoothie. These superfoods are rich in minerals and vitamins. So, what makes this smoothie super? It is just one secret surprising ingredient that makes it super healthy and tasty. Cottage- cheese! It may sound odd for an ingredient to be added to a smoothie, but with the benefits that come along with it, this option is a must- try, at least for once. This thick protein- packed quick breakfast, resists cravings for a long time and keeps you full- like a complete meal. The ingredients added, to, sum up to be a perfect blend to keep up with the busy day ahead. Furthermore, regular use of it results in visible beauty benefits as well. It also detoxifies the body and cleanses the digestive system. This super green smoothie aids in weight loss and gives you that glowing skin you have always been dreaming of. Easy to prepare, this smoothie recipe can be made in less than five minutes in a normal blender- even by a cooking beginner. Hydrating and detoxifying, this super green smoothie gives the feeling of having a fresh tropical juice, thanks to the flavor of the pineapple and banana. Frozen bananas are usually added to smoothies to get the extra thick creamy effect, but the cottage-cheese in our recipe is more than enough to get you that feeling; though we are adding half a banana for a sweet taste. Kale and Spinach provide for all the antioxidants and nutrients needed also giving the super green smoothie, the distinctive “green” taste. The Cottage-cheese in the smoothie, surprisingly gives less of the cheesy flavor, if that’s what you’re worried about. The tanginess of the pineapple and the sweetness of the banana overpowers any of the mild cheesy flavors, even if there. You can add honey for the extra sweetness; can be avoided though if not needed. Add ice cubes and blend till creamy. The main ingredient in all of these power drinks is definitely the “greens”. It is shocking as to the number of variants of greens you can find today. The list is long though the most recommended being kale, spinach, mint, and even broccoli. Imagine if you could try and find out a variant that is rather kid-friendly. I would call it a miracle if one could make a kid eat or rather, drink his greens and enjoy it! Another main ingredient that makes to the green power drink is the cucumber. The refreshing and hydrating properties of the cucumber make it a favorite among most of the green smoothies. Cucumber – apple smoothie is a simple recipe that uses just the two basic ingredients -cucumber and apple and a small amount of sweetener- a dash of honey or maple syrup. This delicious drink when served chilled, makes one of the most refreshing and nutritious drinks that you could drink on a hot summer day! Add frozen banana and ice to make it thick enough to have it in a bowl. A healthy alternative for ice-cream probably! Step 1- Add all the ingredients in the blender. Step 2- Blend till creamy and smooth. Cucumber- Kale smoothie is another variant of a cucumber-based smoothie. The organic super vegetable, Kale is cheap in price yet rich in nutrients and fiber. If you are aspiring for that glowing skin you always wanted, I would recommend you to have this miraculous drink every day. This drink can be prepared with coconut water for a unique tropical taste. A dash of honey and the nutritious green smoothie is good to go! You can also use other additives to your green smoothies to make it more interesting and “greener”! Green apples are commonly available and are one of the best ways to get that extra special tanginess in your green smoothie. It is super easy to add to any of the smoothies as it goes well with almost all ingredients if I may say. Another ingredient that’s making to the green favorite list recently is the green powder or “Moringa powder” which is essentially dried leaves of the drumstick tree. It can be added to any smoothie, just like any other protein powder- only that this is organic and green. Moringa leaves are not widely available in all parts of the world, hence the dried version is innovative and practical. This super source of antioxidants also lowers blood sugar. Well, that should remove some of the guilt if you are a person who likes to add sugar to your smoothie! Green tea is probably considered the healthiest among all beverages nowadays. Besides helping you in weight loss, it also improves brain functioning and makes you smarter over time. Quite impressive, isn’t it? Considering all the impressive benefits that green tea has got to offer, its high time we incorporate this super ingredient into our green smoothies. Yes, the sour taste may not appeal to many, but it can always be masked with a wide array of ingredients to go along with it. Basically, the different variants of green drinks or smoothies have become popular due to a variety of reasons. So, What Makes Green Smoothies Popular? Green smoothies are usually the most preferred drink by vegans, can’t blame them- being “green “it can’t get any more plant-based. Among a wide range of raw food delicacies, the smoothie is the most fancied recently. Obviously, as it serves the purpose of the take- to -go food group most appropriately. Super green smoothies ensure that you include all necessary vitamins and minerals needed in a day, without the slightest effort to fix a meal. They also make for a generous serving that could make for your breakfast or your lunch or even dinner for some people. Green smoothies are the fastest way to boost the metabolism rate. A super green smoothie and a good workout are the perfect combinations if you are somebody who is looking forward to shedding those extra kilos. The usual fruit shakes or sweet smoothies have got a healthy make-over with adding vegetables to it. It is the easiest way to incorporate raw food into your diet. Well, sure enough, the blender actually reduces the effort for one to chop up veggies for a salad, probably saving a ton of time for people with less in hand. If you haven’t tried any of the green smoothies so far, I would highly recommend you to try out the different recipes available all over the internet now. It will leave you feeling good- for making a smoothie and for having the healthiest nutritious version of it! Make your green smoothie “super” by adding any of the super elements available – cottage cheese, chia seeds, flax seed, nuts or berries. Not only does it make your green smoothie super healthy, but also gives you different flavors of your otherwise stale green smoothie. After all, it’s all about trial and error when it comes to making a perfect smoothie that suits your taste buds. You can have it many ways, as thick as a shake or strained as a juice. Add more natural sweeteners or other flavors to make your super green powerful drink to taste different and delicious; there are quite a lot of alternatives to try. You probably would have got some ideas from this article. Go on, experiment with all kinds of greens, mix and match and find the perfect green smoothie that makes you happy and full. Considering all the processed food and beverages that one tends to have today, a super green smoothie is a savior when it comes to getting rid of all toxins from the body. It definitely is worth a try, counting the health and beauty benefits you could gain of it, saving you plenty of time and money, with minimal effort. As the modern day saying goes, “go green”; the least you could do right away, I would say is “drink green”. The recipe is super simple and easy to follow, giving you all the right reasons to try it out. Well, if that isn’t enough motivation, then read along to understand the benefits of the super green drink. The Kale in the recipe is high in nutrients and low in calories. This super healthy green also boosts the smoothie with all the antioxidants needed to keep your look and feel young! Kale is considered to have a great amount of Vitamin C, even a cup of it contains more vitamin C than that found in an orange. Spinach is a green vegetable, loaded with nutrients and antioxidants, keeping you away from cancer and other ailments. Also, it lowers blood pressure levels and contains plenty of fiber and vitamins K and C.
Cottage-Cheese is cheese, yes, but of low- calorie. It has a mild flavor making it easy to add to recipes like smoothies. It is packed with nutrients and proteins. The feeling of fullness you get by having this super ingredient keeps you away from resorting to mid-meal snacks, leading to weight-loss! Adding the super ingredient makes your green smoothie super in all ways. Cottage-cheese is amazingly rich in proteins, B- complex vitamins, calcium, magnesium, and zinc. Pineapple not only makes the super green smoothie delicious and tangy; this nutrient-packed fruit also provides natural distinctive sweetness. Pineapple aids in digestion and also boosts immunity. The Banana provides several amazing health benefits and also aids in weight loss. They are easy to add to any recipe; especially to a smoothie. Honey gives the natural sweetness to the super green smoothie. Its antibacterial properties, helps you to recover from wounds and keeps you away from common ailments like the flu. The blend of all sums up to be a winner among all the green smoothies you might have tried out. And of course, the secret super ingredient in the green smoothie gives a twist to a regular green smoothie- a “super” twist! So, much for a unique way to make your green smoothie. But there are other tasty and delicious versions of the basic green smoothie.